Cut your peg board to the size you want. Hold in place against the wall and, having checked that it is level, mark with a pencil through suitable holes where the fixing screws will go. Remove the board and drill the holes into the board, insert wallplugs. Line up the board against the wall. 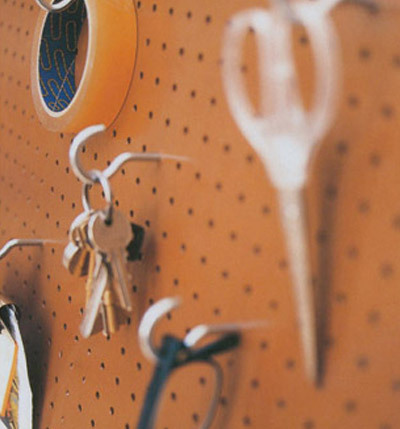 Insert cup hooks in staggered rows across the board and hang up keys, spectacles, scissors, bulldog clips to hold memos and anything else that the peg board will keep out of the way. What you need: peg board, saw, spirit level, pencil, drill, wallplugs, cup hooks, screws, screwdriver.